Beautiful Glendale, AZ outdoor fountains and water features. Water features are a popular addition to Glendale landscaping and courtyard designs. With normally limited space in walled courtyards, the wall fountain is often requested. 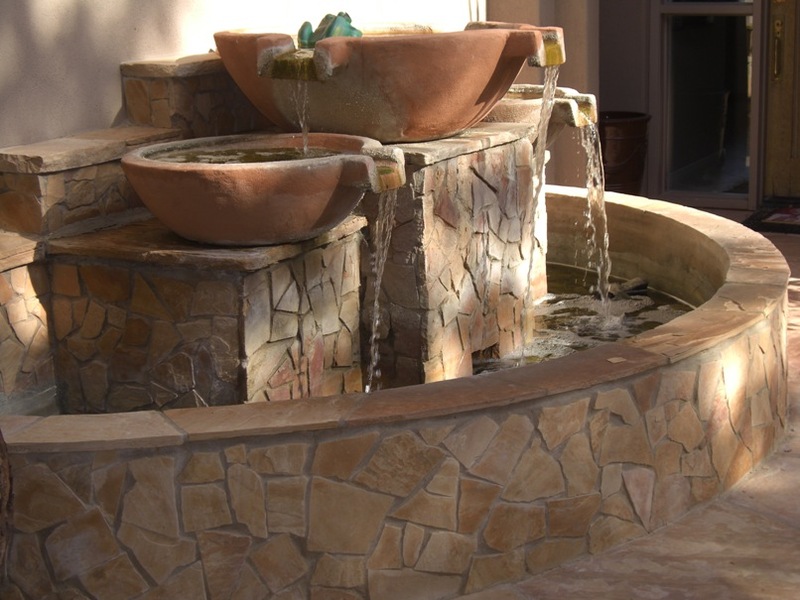 This custom designed outdoor fountain’s made from stone masonry in the form of rustic mosaic with desert contemporary flair. The result on this unique water feature is simple yet very stunning. Sometimes less is more, and this outdoor water fountain’s a testament to that fact. Different sized terracotta spillpots on the three square pedestals inside the basin heightened the relaxed air of this wonderful custom design. For all your Glendale landscaping needs, Desert Crest excels at Arizona landscape design and installation, along with being skilled at stone masonry. This allows us to complete every project we design without relying on other contractors. © Copyright Desert Crest LLC. All rights reserved.